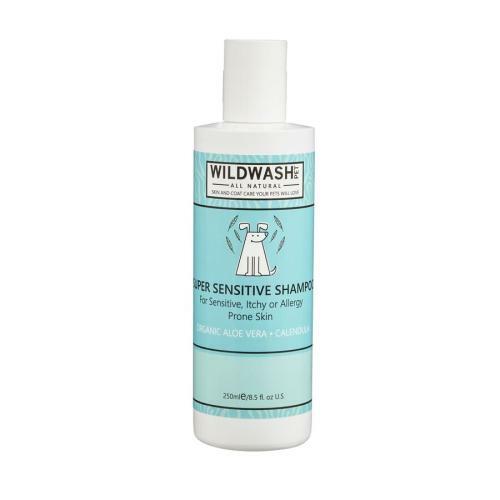 WildWash Pet is a range of natural pet cosmetics, containing No Parabens, No Phosphates, No Sulphates, No Phthalates, No Petrochemicals and No PEGs. Quick rinsing and kind to their skin, your pets will love you for it! Our Super Sensitive Shampoo is especially designed for dogs with sensitive skin. It uses Organic Aloe Vera and Calendula. Aloe Vera is known to hydrate the skin whilst soothing and promoting skin renewal and Calendula has a long history of use as a wound-healing and skin-soothing botanical.